Circumrotatory chess: ‘... much practice in matches of this kind has made him very proficient in circumrotatory chess.’ City of London Chess Magazine, June 1875, page 130. Conversation game: ‘There will shortly commence a conversation game between some New York players and members of the Williamsburgh Club.’ The Albion, 19 March 1870, page ? Correspondental: ‘To prevent unlimitedly tedious prolongation in a correspondental game between two clubs, there is generally a fixed time allowed for each move ...’ Page 33 of A Popular Introduction to the Study and Practice of Chess (London, 1851) written by S.S. Boden but published anonymously. Counter-check: ‘Is the word counter-check a legitimate Chess-term? If so, what writer on the game has used it?’ Chess Monthly, May 1861, page 137. Dilemma: Obsolete term for fork. 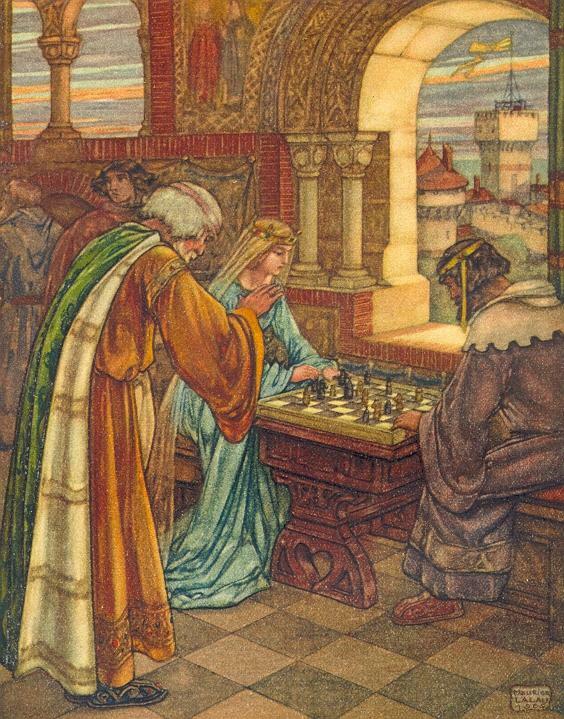 See page 128 of Chess Facts and Fables. Enigma: ‘A termination of a game; an end-position, not represented upon a diagram, but written out.’ Chess Monthly, October 1858, page 297. Gamekin, gamikin: see C.N. 8881. Losish: ‘It is usually no harder to win a drawish game than a losish game, and the latter has the disadvantage that you may lose.’ Cecil Purdy on page 16 of the Australasian Chess Review, 25 January 1939. Masque game: ‘It has also been announced that the last-mentioned Club will give a masque game upon a ball-room floor ...’ The Albion, 19 March 1870, page ?. Pawnence: ‘The board has been rent in two. The king-side belongs to White; the queen-side is Black’s. And Black is ready to collect pawnence! The isolated pawn is doomed.’ Chess Review, April 1950, page 120. See C.N. 8561. Pedaneous chess: ‘We believe this was the first occasion of his undertaking pedaneous chess ...’ City of London Chess Magazine, August 1875, page 196. Problemistically: ‘Although he has not been very active problemistically since the Westminster Gazette column disappeared the problem world is poorer for his loss.’ BCM, January 1933, page 44 (obituary of J. Schumer). Re-diagram: ‘Below we correctly re-diagram the entry that won first prize.’ Chess World, 1 January 1947, page 23. Sacs-back: ‘For the next half-dozen moves a cardinal consideration is the efficacy of possible “sacs-back” on d5.’ Playing to Win by J. Plaskett (London, 1988), page 66. Simultanee: ‘The simultanee should keep an eye on the rate of progress of the single player ...’ BCM, April 1943, page 74. Skalitzka system: See C.N. 9140. Snowball game: A term used on page 196 of the July-August 1919 American Chess Bulletin and on page 212 of the April 1920 Chess Amateur. See C.N. 8639. Zugzwanger: ‘A typical “Zugzwanger”.’ How to Win in the Middle Game of Chess by I.A. Horowitz (New York, 1955), page 108. Acknowledgment: Jerry Spinrad (conversation game and masque game – see C.N. 4226). C.N. 9247 gave the definitions of a number of terms proposed in the glossary on pages 154-156 of The Most Valuable Skills in Chess by Maurice Ashley (London, 2009): Bear Hug Mate; Co-protective relationship; Crossing point; Landmine square; Protector; Quad mate. Information on earlier instances of any of the above words will be gratefully received, as will citations for similar words. Latest update: 1 October 2016.